Beautiful home with Private Pool and Hot Tub! Brand new home in Tierra Linda! Nice lodge 5 bedrooms, 5.5 bath, sleeps 27 guests! Newly Renovated home in the Tierra Linda Subdivision, with PRIVATE POOL! Mountain Valley (2 miles from River Access & walking distance to golf course) w/pool and hot tub! 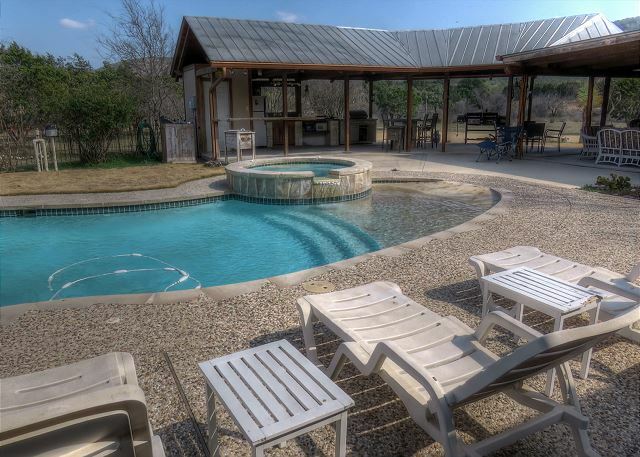 This spacious, tastefully decorated newer home in Tierra Linda Subdivision has vaulted ceilings, granite throughout, covered Porch and Cabana with outdoor kitchen and Bar overlooking the private pool, and amazing views of the Frio River Valley! Shallow Water, located in the Tierra Linda Subdivision! Home located in Popular Mountain Valley Subdivision close to the Golf Course & House Pasture!